Get Daily Recipes.com | 6 Typical Foods With A Twist! 5 Easy Recipes You NEED To Know To Lose Weight! There are some recipes that we actually get sick of seeing…or eating. So we’ve found 6 recipes that take typical food and add a twist! 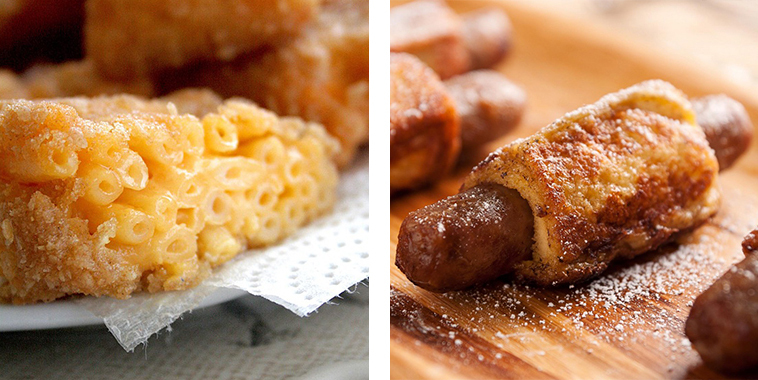 Everyone has had mac and cheese…but now you need to try it deep fried! At first I was like what? Then I was like woah. Well, these definitely step up your pancake game! Yum! I’m sure you’ve had sausage before, and of course french toast, but have you tried them as one!? Cheeseburger soup is surprisingly delicious! Peanut butter, plus s’mores, plus blondies all in one!? Genius! Not your typical treat!